At the start of the hiking season, I wrote a trail review for the Vibram Five Finger EL-X. I've since put this pair of footwear to the test. Used in backpacking on and off the trial, even non-traditional mountaineering. Traveled in/on Ice, Snow, Glaciers, Rainforest, the rugged Olympic Coast, Scree, Rock, Moss and even walked down/over wind fallen trees. These little guys were also randomly on my feet in Escalate, Utah. I still stand behind every statement in my first review of the EL-X. It's a good piece of kit to have in your lineup. Even if you just use them as a secondary footwear source, such as in camp or river crossings. I found the tread to be superb for winter and/or slippery conditions. Vibram EL-X, with 3 months of heavy use. Complete upper failure on the inside forefoot. Plastic-like material, acting as a skeleton for the upper cracks in below freezing conditions. The same material is used in the Spyridon upper. 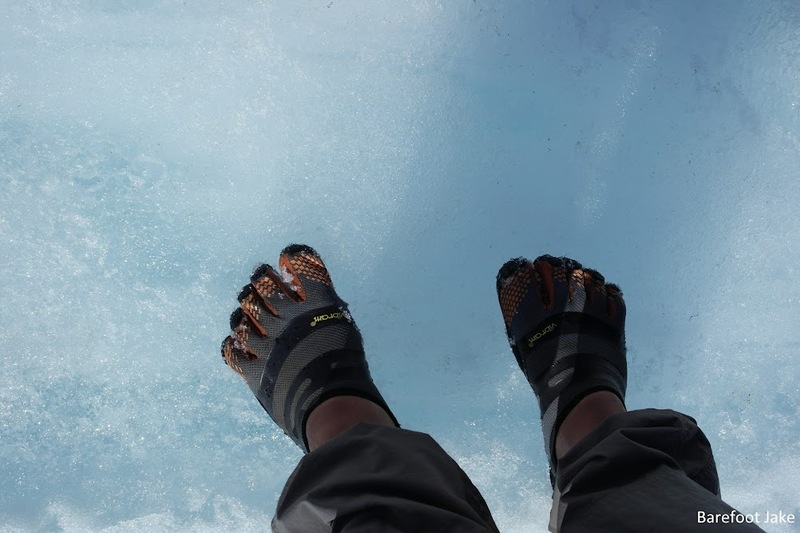 Vibram EL-X crossing the Blue Glacier of Mount Olympus early spring. Top of Upper still intact. Sole has little to no wear. Strong and durable rubber. Vibram EL-X footbed still intact. They need to do the same footbed design to the Seeya, which falls apart easily. On the shoulder of Mount Deception, looking back from which I came. Plan on purchasing another pair this winter, to replace these for next season. I still hike in these to this day. Suggest these to anyone looking to do rough off trail terrain and snow travel. Do not suggest these for long mileage hiking days, since overused trails strip away the natural surface that should be in place, to act as cushioning. The pair of Vibram EL-X I own, some would say they are 'destroyed'. I find them still hike-able, since the sole is still functioning and intact. Would like to add, that the soul is a bit too thin for long mileage on rocky terrain types. Never thought I would say this, but a bit of thickness is good for long trail days on sharp rock. Suggest using the 10 mm rule, for anything over 15 miles a day. Disclaimer: Barefoot Jake purchased this footwear with own money and had no obligation for this review.